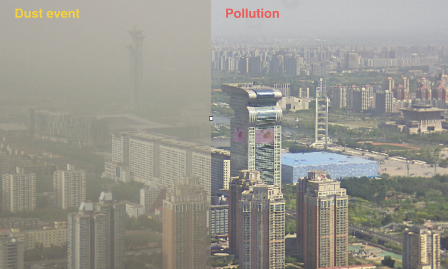 Frequent occurrence of both anthropogenic pollution and natural dust in East Asia has great impact on regional air quality, human health and climate. Until now, their interaction and consequent effect on dust morphology remain statistically unclear, because even though the traditional filter-based bulk sampling method can provide accurate chemical compounds, it cannot distinguish the mixing state of chemicals with dust particles. “Single-particle inspection using electro-microscopy can identify coated/contaminated dust particles,” says Dr. PAN Xiaole from Institute of Atmospheric Physics, “but real-time measurement on the morphological variation of dust particles was difficult due to labor-intensive manual operations.” In a recently published paper in Scientific Reports, PAN and his collaborators from China and Japan investigated polarization of the oscillation direction of the back-scattering signal of single dust particles online using a newly developed bench-top optical particle counter. A real-time decrease in Asian dust depolarization was observed in North China for the first time. PAN reckons that it can only be caused by the decrease in the particle aspect ratio, which was reflected by the coating of an air pollutant, such as the deliquescent dust-nitrate Ca(NO3)2. “This phenomenon was obvious when the dust particles were stagnant in a polluted region with a high relative humidity condition,” says PAN. The statistics highlight the significant importance of internally mixed “quasi-spherical” Asian dust particles, which were more hygroscopic and likely to act as cloud condensation nuclei (CCN). Because the NOx emission in East Asia has been rapidly increasing over the last decade, their findings imply that nitrate has become increasingly important on the morphological change of Asian dust and its subsequent spatial allocation. Their findings have been published and online in Scientific Reports. I trust you found this article on Morphological changes of dust particles interesting! Enjoy your day!